We have seen countless styling packages for the Lamborghini Aventador over the past years, but the official teaser images often leave you wanting for something more real, more tangible, and less staged. This is why we were glad to discover these photos (allegedly coming from Cannes, France) showing an Aventador coupe with the Molto Veloce body kit by German tuner DMC on. Released in 2012, the kit contains a front spoiler lip, bumper extensions, new side skirts, a custom rear wing, and a restyled diffuser. Back when the package came out, DMC used to ship it along with a rather hit-or-miss forged wheel set. 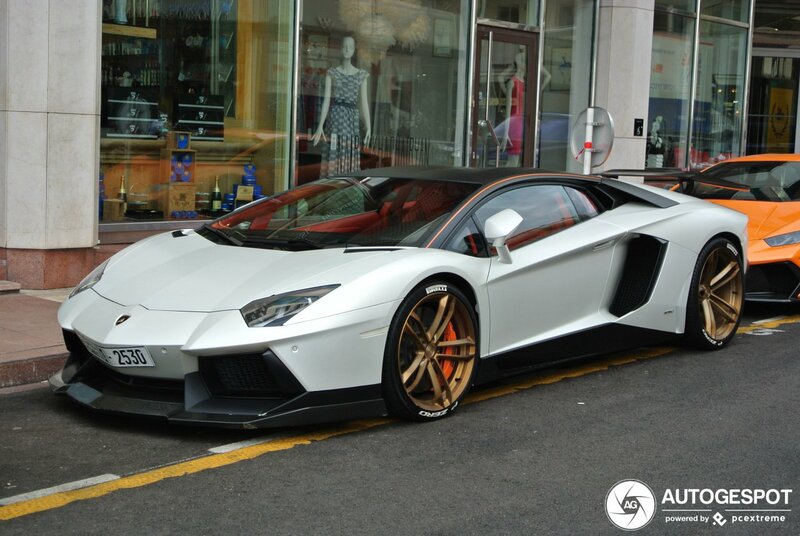 Thankfully, this particular Lamborghini Aventador takes advantage of a much better-looking set consisting of gold-painted five dual-spoke rims clad in Pirelli P-Zero rubber. Aside from the styling changes, this Lambo sports the LP900 power upgrade that encompasses chip tuning, an ultra-lightweight titanium exhaust system (3.45 kg / 7.6 lb. ), various intake and exhaust system improvements, a new fuel pump, and dedicated intake throttle plates (one per each of the 12 cylinders). As such, its output currently exceeds 900 horsepower (671 kilowatts).